Instant supplemental heat! Ideal for heating cold areas in RV's, vans, boats, trailers, cabs, and more. Virtually any vehicle. 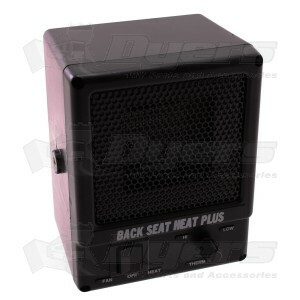 The Back Seat Heat Plus, the powerful, compact heater you can warm up to instantly. Puts out over 1100 BTUs of heat. Cars, vans, trucks, boats, trailers, RV's, cabs...virtually any vehicle. On/Off switch for remote operation. All necessary wiring and hardware to install.